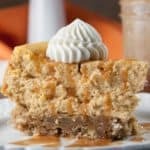 A spiced pumpkin cheesecake with blondie bottom is like two desserts in one- a pumpkin cheesecake from scratch with a white chocolate chip pumpkin spiced blondie on the bottom! It’s like two desserts in one! 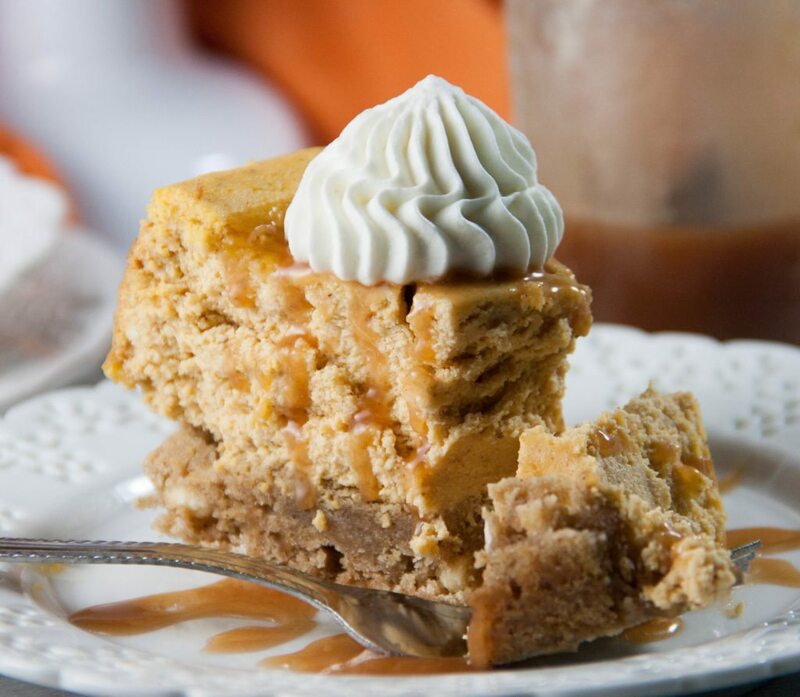 Oh my this pumpkin blondie cheesecake. If I was going to make a list of my favorite desserts I have created on this blog, this dessert is going on it. I’ve been wanting to create a blondie bottom cheesecake for awhile now. And what better time than Pumpkin season? Am I right? I’ve been full tilt pumpkin recipes for a little bit now. 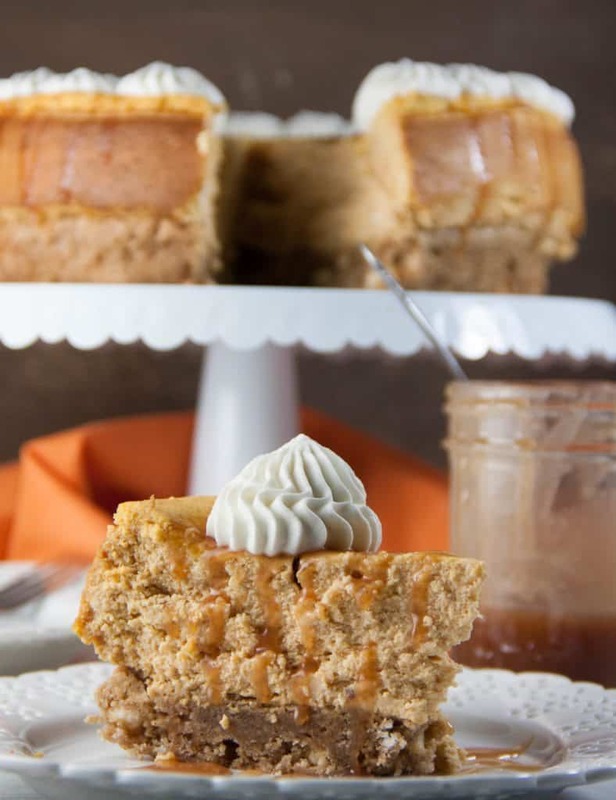 With these pumpkin spice latte cupcakes, these white chocolate pretzel pumpkin blondies, and over 65 other pumpkin recipes to check out. So this time, I took pumpkin to a whole new level- a pumpkin cheesecake with this pumpkin blondie instead of a crust. Two pumpkin desserts in one. You’re ok with that right? I thought so. 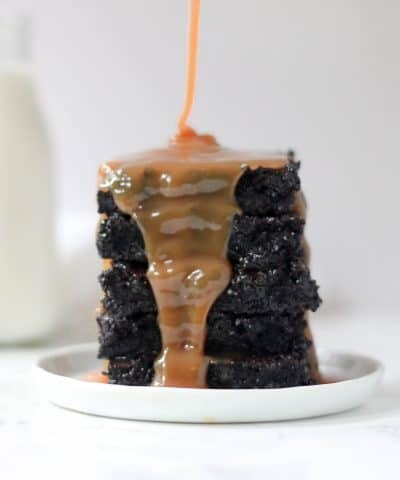 Top it off with whipped cream and a drizzle of salted caramel sauce. Hello dessert for my Thanksgiving table. How do you do? First start by making the blondie bottom. 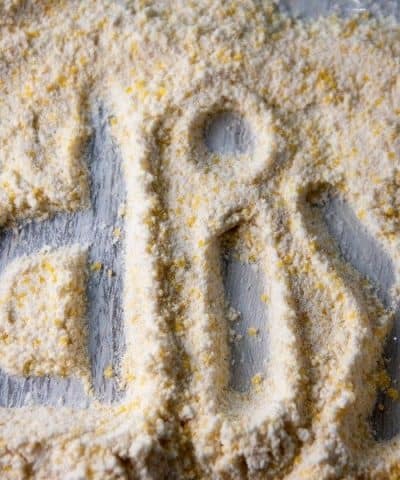 Start by combining your dry ingredients- flour, baking powder, salt, pumpkin pie spice. Then add in your wet ingredients- melted butter, brown sugar, vanilla extract, and 1 egg. Be sure to not overmix! And then fold in the white chocolate chips. 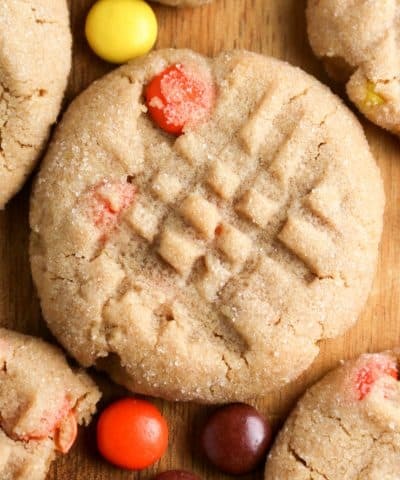 Then bake the blondies in a round cake pan. While the blondie base is baking, prepare the spiced pumpkin cheesecake filling. 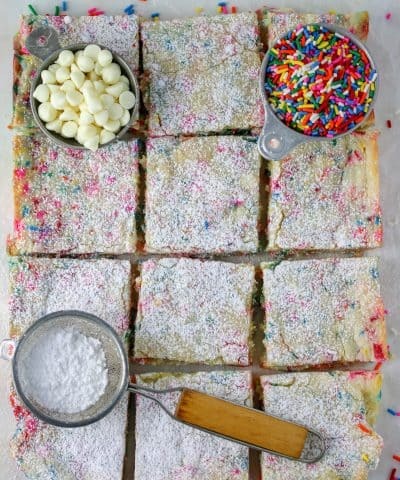 Start by lining the bottom of an 8-inch springform pan with parchment paper. Then using an electric mixer, beat the cream cheese and 3/4 cup sugar on medium-high speed until light and fluffy, about 2 minutes. Pro Tip: Be sure to use room temperature cream cheese so you don’t need to mix it that long. Mixing the cream cheese for too long will add too much air into the batter, which will cause the cheesecake to crack. Be sure to scrape down the bowl and then beat in the eggs 1 at a time, beating well after each addition. Add the pumpkin puree, sour cream, vanilla and pumpkin pie spice and then beat just until combined. Sprinkle the flour over the mixture and beat on low speed until just combined. Then pour the batter into your prepared pan and bake. To bake the cheesecake you want to bake the cheesecake in a water bath. A water bath is a method of slowly cooking the cheesecake. Cheesecake is a type of custard and needs to be baked slowly so we end up with a smoothy creamy texture in the end. We accomplish that by baking our cheesecakes in a water bath. A water bath is made by placing the cheescake in a larger pan. And then hot water is added to the large pan about halfway up the cheesecake. You want to make sure to completely cover the cheesecake pan in tin foil (about 3 layers), or you can cover the cheesecake in a slow cooker liner. There is a great tutorial from Life Love and Sugar on how to do that. Once the timer goes off, you want to let the cheesecake cool in the oven with the door open slightly for about 2 1/2 hours. Once the cheesecake and blondies are cooled, then it’s time to assemble. Remove the blondie and cheesecake from the pan. You want to place the pumpkin cheesecake on top of the blondie bottom. If you want, you can top the cheesecake with whipped cream! Use room temperature cream cheese. 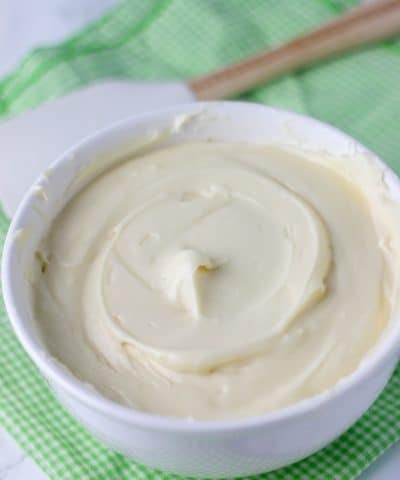 Room temperature cream cheese will ensure a creamy lump free cheesecake. Do not over mix. Overmixing will incorporate too much air into the cheesecake and could result in cracks in the top of your cheesecake. If you do get cracks in the top of your cheesecake, just cover up with some whipped cream and caramel sauce. No one will know. No one will care. Use a hot water bath. Place an oven-safe pan in the oven on a lower rack and fill with boiling water during the baking process to help prevent cracks. Bake low and slow. You will bake this cheesecake at 425 F, but only for 15 minutes. Then lower the oven temperature to 250 F for an hour. Then, turn your oven off and let the cheesecake remain in the oven, with the door propped open for 2 hours. For the blondie bottom, I used my tried and true blondie recipe that I have used on here countless times. Like to make these M&M brown butter blondies, these kitchen sink blondies, these bourbon caramel chocolate walnut bars, or these apple pie gooey bars. This time around, I cut the recipe in half and added in some pumpkin pie spice. You could buy a jar of pumpkin pie spice or make your own. Making your own is so much cheaper in the end! I highly recommend it. You probably have all the spices sitting in your pantry! This dessert is much easier if you make it over several days. I made the blondie bottom first in an 8-inch cake pan, lined with aluminum foil the first day. The second day I made the cheesecake and wrapped it in plastic wrap. The third day I assembled the dessert. Making it over several days made making this dessert a breeze! Listed below are the items you need to make this dessert. These are affiliate links that will re-direct you to Amazon. If you make a purchase, I will receive a small commission that will cost you nothing extra! The commission will go back to this blog to keep it cranking out crazy good recipes for you! If you make this dessert, be sure to take a photo! Share it with the #bostongirlbakes so I can see! And don’t forget to follow along with me on Twitter, Instagram, Facebook, and Pinterest! For the blondie base: Adjust oven rack to middle position; heat oven to 350° F. Line a 8-inch round cake pan with foil, leaving enough overhang to help you lift the blondies from the pan when they're done. Grease foil-lined pan with butter or oil. Whisk flour, baking powder, pumpkin pie spice and salt together in medium bowl; set aside. Whisk melted butter and brown sugar together in medium bowl until combined. Add the egg and vanilla and mix well. Using rubber spatula, fold dry ingredients into egg mixture until just combined; do not overmix. Fold in chocolate chips and spoon batter into prepared pan, smoothing top with rubber spatula. 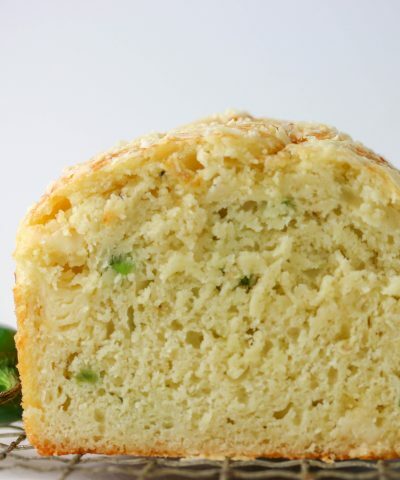 Bake until top is shiny, cracked, and light golden brown, 22 to 25 minutes; do not overbake. Cool on wire rack to room temperature. Remove bars from pan by lifting foil overhang and wrap in plastic wrap until ready to assemble the dessert. For the cheesecake: Line the bottom of an 8-inch springform pan with parchment paper. Set aside. 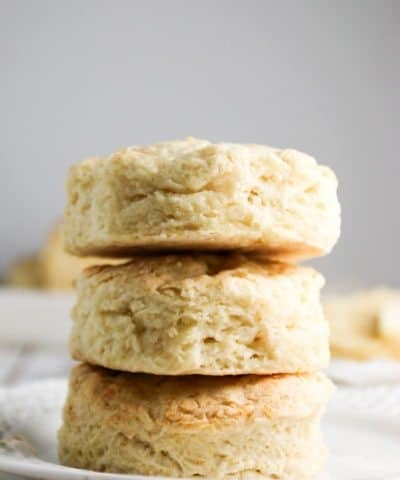 Using an electric mixer, beat the cream cheese and 3/4 cup sugar on medium-high speed until light and fluffy, about 2 minutes. Scrape down the bowl. Beat in the eggs 1 at a time, beating well after each addition. Add the pumpkin puree, sour cream, vanilla and pumpkin pie spice; beat until combined. Sprinkle the flour over the mixture and beat on low speed until just combined. Place the springform pan on a baking sheet and pour the filling into the shell. Bake for 15 minutes. Lower the oven temperature to 250 degrees and bake for 1 hour longer. Turn off the oven and let the cheesecake cool in the oven with the door ajar for 2 1/2 hours. Transfer to a rack and let cool to room temperature. Refrigerate uncovered until thoroughly chilled, at least 10 hours or up to 2 days. Remove the side of the pan and let sit at room temperature for an hour. To serve, remove the parchment paper and place the cheesecake on top of the blondie base. To cut the cheesecake into wedges with a sharp knife thats been dipped in hot water and wiped clean after each cut. Serve the cheesecake slightly chilled or at room temperature with whipped cream and caramel sauce if you so choose! Chef Mireille I feel like you get me 😉 heavenly is the perfect word for this dessert! 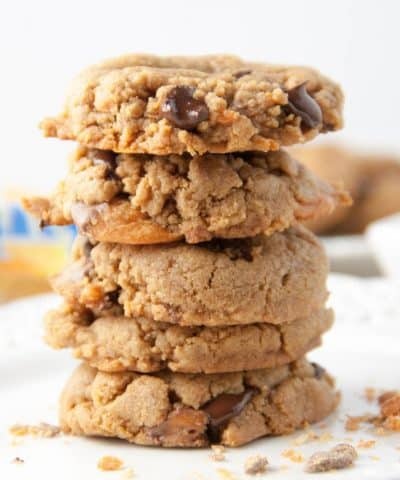 Blondies are my all time favorite baked good, love the idea of using it as a crust! This looks AMAZING! A perfect Halloween/Fall dessert. I will have to try this one. Thanks Bintu 🙂 yes this dessert is dangerous! Blondies and cheese cake. Oh boy, I’m in! Not a fan of pumpkin.., however, these look very attractive. Thanks Laura! Making your own pumpkin pie spice mix is super easy too! Adding just the spice and not actual pumpkin puree gives it the pumpkin flavor while keeping the blondies super chewy! Wow, this just sounds incredible. What a combination! Thanks Dahn 🙂 can’t go wrong with pumpkin on pumpkin! WOW..yet another awesome pumpkin recipe to try. There are never too many ways to cook/bake with pumpkin. I love it ALL year round. 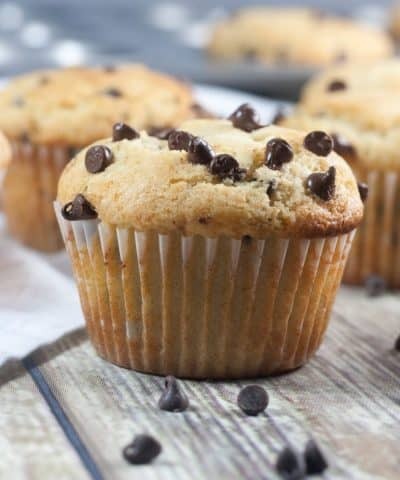 Love the blondie bottom to this recipe….delicious. Thanks Gloria! Yes the difference in texture between the blondie and cheesecake made this just absolutely crazy good!! And I agree, there is just never enough pumpkin recipes to satisfy my sweet tooth! I am so excited I found this recipe. I had said to the women in my family that this year I would still do my corn pudding but I also wanted to take desserts. 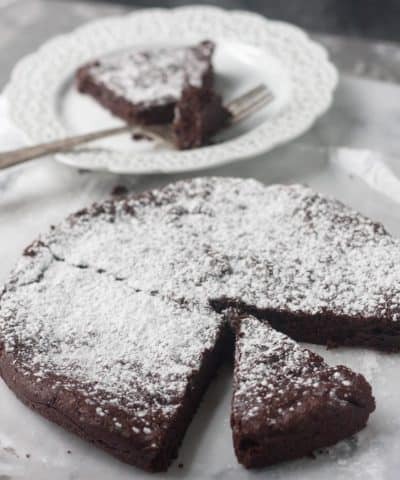 I love love love baking and creating different heavenly decadent sweet yums, but I try to consume real foods that are healthy and minimal carbs and those are usually done by 1 pm, so I don’t do as much dessert making anymore nor have I beenbtasked to do it for get togethers in a while. I’m also getting older and it’s getting harder to maintain my younger figure plus my husband who is 8 years older than me is still the same and always will be as he scarfs down all the junk and sweets he wants… Ugh, makes me sick and so mad that he tortures me daily with watching him eat it all and having so much around to tempt me. However, until about 2 weeks ago, I have maintained my willpower and quite proud of myself, and now I cannot help it (I think it’s from stress). So, my mind has gone crazy with ideas of pure deliciousness and mix/match combos of all the best yummy yum sweets and I thought, i want to take the “traditional” Thanksgiving desserts and really really deck them out in heavenly decadence and claim back my dessert title. Anyways, sorry for the long story, one thought was doing something Blondie and seasonal and another pumpkin with chocolate and salted caramel (also instead of a chocolate mousse/pudding a Rocky Road brownie pudding pie and some type of apple/pear praline thing). We’ll, I started looking and found found some recipes but I wanted more. The my sister said she is doing an apple cake thing so don’t do any apple and so I just nixed the fruit all together and said to myself. 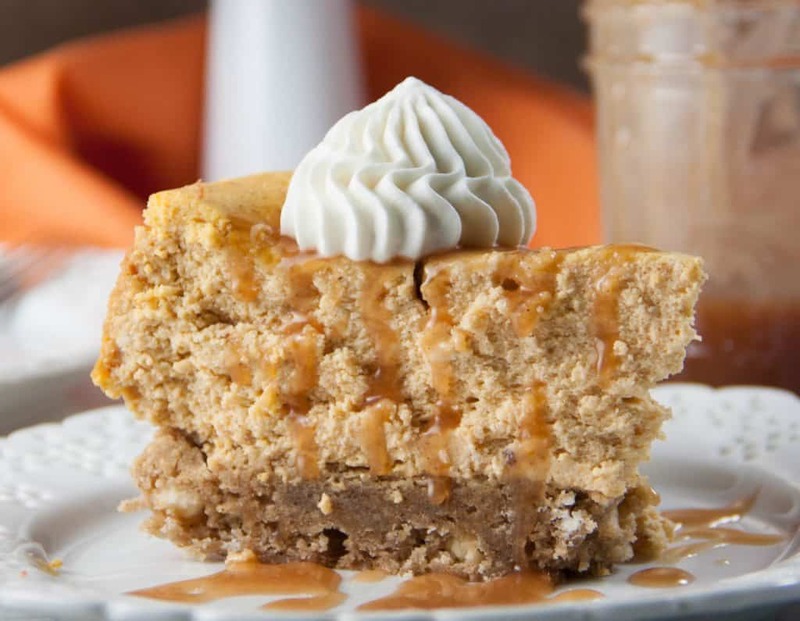 Why can’t I do the salted caramel pumpkin cheesecake with a Blondie crust instead of boring old graham cracker and BAM!!!!! A women with the same brain already did it and even Has a nice descriptive yummy recipe laid out for me. And it’s good!!! Woo hoo!!! Thank you Lord for women who love to bake and cook and get creative too! My mouth waters at the thoughts. Everyone is getting fancified dessert this year and I am just so excited. I am starting it today and finishing tomorrow. My husband is super stocked too because he loves bkondies, white chocolate, caramel, brownies, all the yum I’m making. Thank you so very much for loving to explore options, be creative, and sharing with the rest of us, seriously, you just have no idea HW excited I was when I thought it and it was no trouble to find. It just popped up taking the guess work out if it. I will post after I make it (hopefully I haven’t lost my skills… Lol) with a pic and after it’s finished with the comments I received. Thank you!! One question: do the marshmellows stay whole or have you tried it to make gooey? Hi Rebecca! I’m so happy you found my blog and this dessert! And thank you so much for the kind sweet words too 🙂 I didn’t use marshmallows in this- but white chocolate chips- althought I suppose you could use marshmallows or better yet marshmallow bits if you can find those because I find marshmallows tend to disappear on me when they bake! You could always try topping it in the end with marshmallows and use a torch and lightly toasting them! Now that would be a fun addition to my dessert! Have fun making it! And take a photo and share just include the @bostongirlbakes so I can see 🙂 Happy Thanksgiving!! Oops I didn’t mean marshmallows… Lol. At the end of my looong comment, I mixed that question up with the other dessert I’m doing (Rocky Road Brownie pudding pie). So sorry. My cheesecake is finishing up now and I will assemble tomorrow afternoon. Yay! Cannot wait. Thanks again! You have a lot of great recipes on here, so definitely glad I found your site! ? Hey you might be onto something with those marshmallows 😉 Thanks Rebecca! I’m glad you did too!